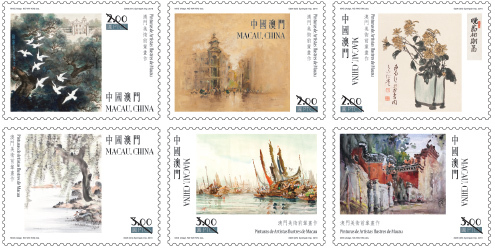 Stamp Issue "Paintings of Macao’s Famous Artists"
The artworks that spanning half a century created by the Macao’s senior painters have pushed the creations of Macao’s Chinese painting, oil painting and watercolour painting to the peak, laying a foundation for the development of contemporary art in Macao. 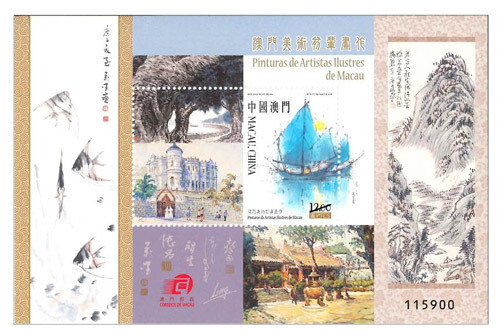 Macao Post will issue the stamp theme “Paintings of Macao’s Famous Artists” on 25th August, 2016, aimed at raising public awareness about aesthetic education and paying tribute to the forerunners who have contributed to fine arts in Macao. 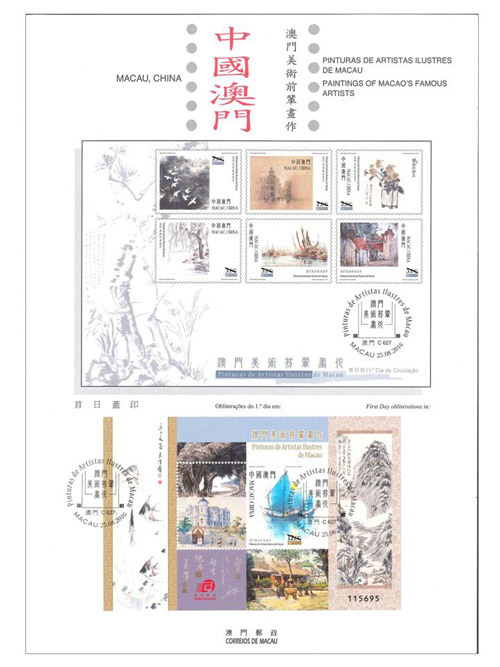 This issue includes a set of six stamps and one souvenir sheet, it has recorded twelve beautiful works from the artists created in Macao, the paintings of stamps are “Nest-bound Birds”, “Post Office”, “Meeting at the later year”, “Fishing Alone in the Willow Shade”, “The Lifestyle of Fishing Harbour” and “A Ma Temple”, the paintings in the souvenir sheet includes “Sai Van Waterfront”, “The Convent of the Precious Blood”, “Sailing Boats”, “Angelfish”, “Kun Iam Temple” and “Mountain and Water”. 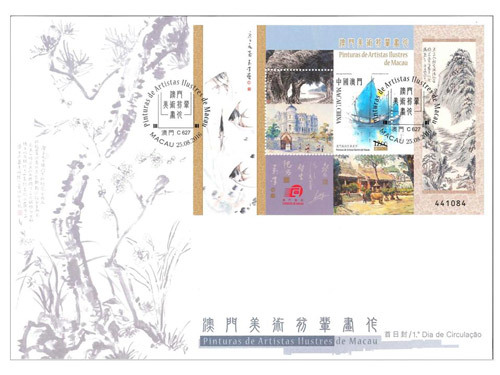 The image shows on the first day cover “Pine, chrysanthemum, flowers and birds” was the collective painting of 10 famous artists. 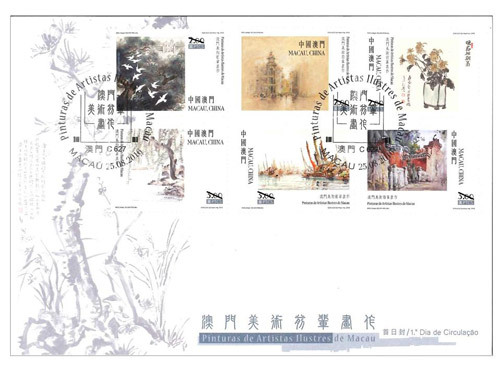 The painting of this stamp issue and the text of the information brochure are responsible by the Macau Artist Society. 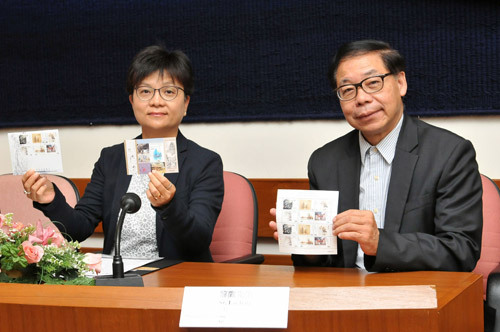 The composition of this issue is designed by Mr. Ng Wai Kin, and the text of the information brochure is written by Mr. Lai Ieng and Mr. Chan Kai Chon. 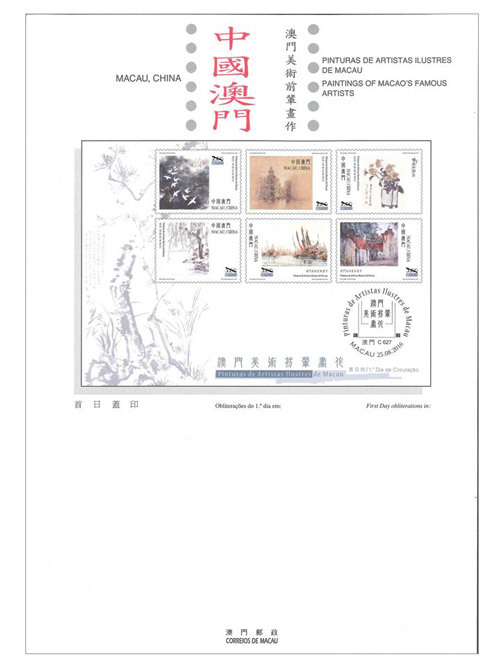 This is the tenth theme in 2016. 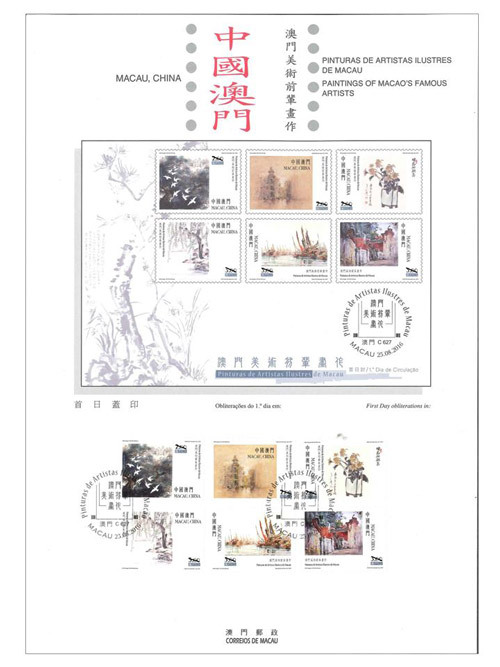 The previous issued stamps are “Lunar Year of the Monkey” on 22/01/2016, the label stamp “Lunar Year of the Monkey” on 22/02/2016, “Scenery of the Imperial Palace in Beijing” on 01/03/2016, “325th Anniversary of the Establishment of the Public Security Police Force” on 14/03/2016, “Chinese Classical Poetry – Ballad of Mulan” on 08/04/2016, “Macao Seen by Chan Chi Vai” on 28/04/2016, “Museums and their Collections V – Maritime Museum” on 18/05/2016, “FIVB Volleyball World Grand Prix™ – Macao 2016” on 17/06/2016, “Mountains and Rivers of the Motherland – Yangtze River” on 11/07/2016, and “Games 2016” on 29/07/2016. 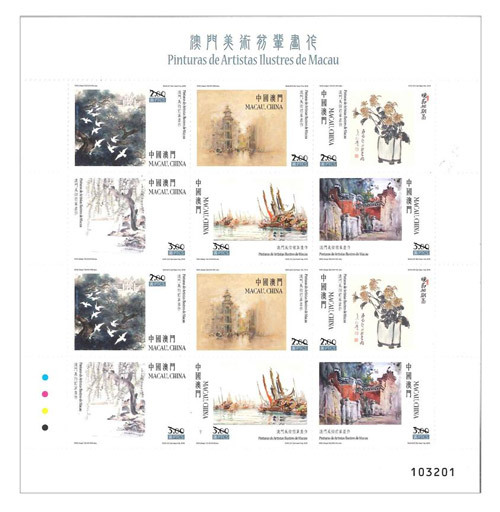 Technical Data of Stamp "PAINTINGS OF MACAO’S FAMOUS ARTISTS"